It’s so easy to find inspiration: interesting garden projects, gorgeous plant combinations to try, and beautiful things to make. The hard part is finding the time to actually try some of the wonderful ideas that other people have come up with. My own to-do list is ridiculously long, but over the past few months, I’ve been ticking a few things off of the list and having a great time doing it. One project I’m particularly excited about has been at the top of the list ever since I read about it in the March 2014 issue of Gardens Illustrated. 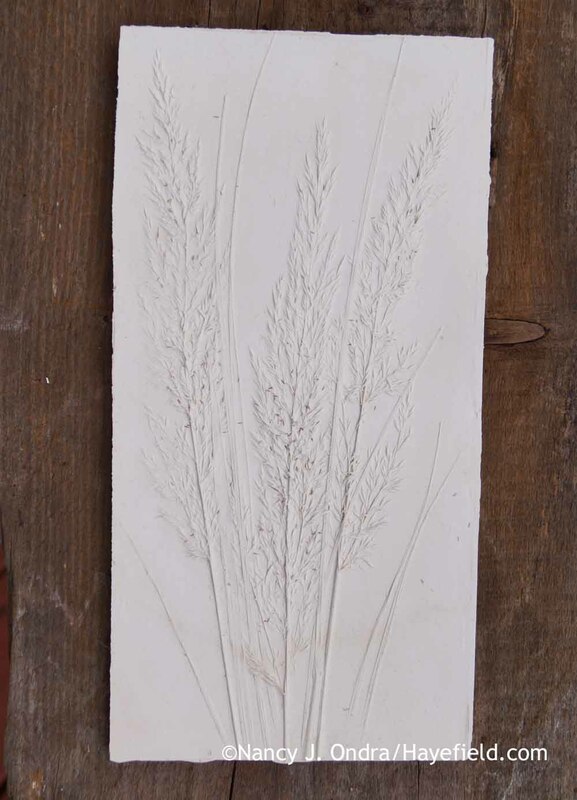 The article, which you can read online here, features the work of Rachel Dein, owner of Tactile Studio in the U.K.. 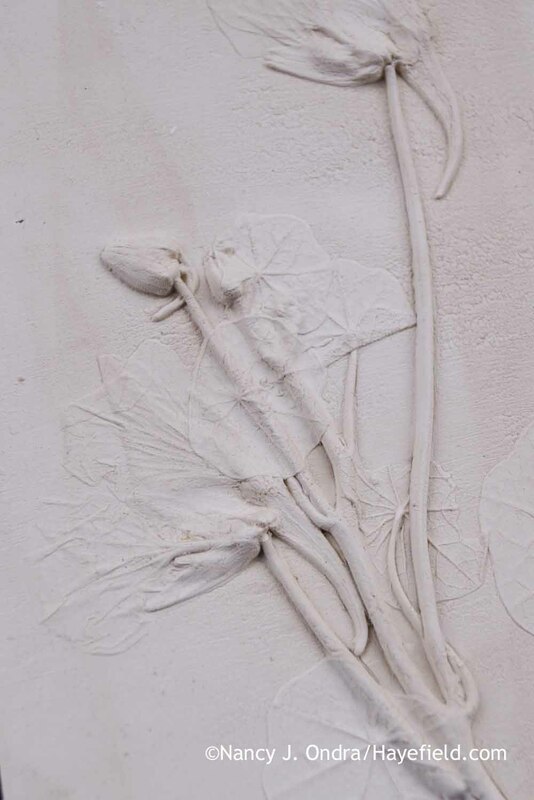 It focuses primarily on her work with making plaster castings of plants, though she works with other materials as well. The photos of the finished projects were so enticing that I knew I had to try the process for myself. Flowers were an obvious place to start, but they turned out to be the trickiest to work with. 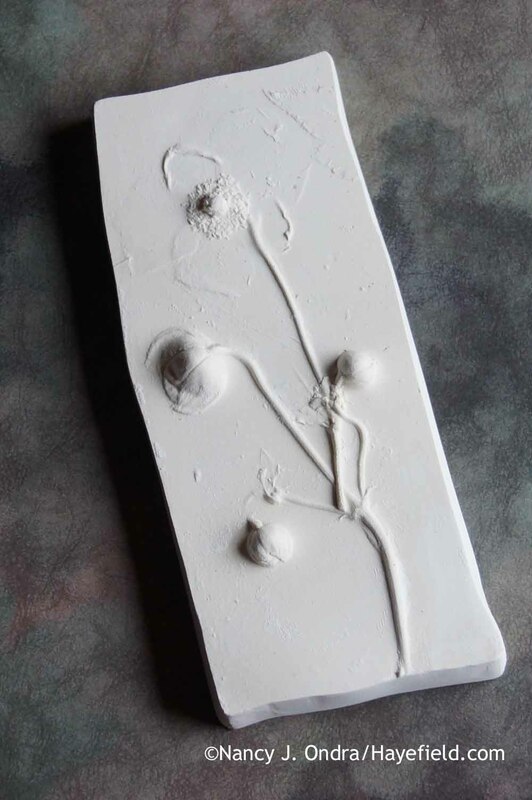 Those with thin, delicate petals are easy to press evenly into the clay with a rolling pin, but their impressions can be very subtle. These colchicums had just enough substance to make for a beautiful casting. More intricate, 3-D blooms can look crumpled when flattened, depending on how you place them. Some, such as nasturtiums, seem to work better from the side; some press better if they are face-on. Flowers that are already relatively flat can work well, but the impression they leave can be very subtle unless they have some distinctive parts, such as the center disc of a single daisy, or the boss of stamens in the center of a fall anemone or a single rose. The blooms of Spanish flag (Mina lobata) pressed beautifully, too: enough to show the parts inside the flowers as well. Sturdy blooms and bloom clusters tend to give excellent impressions. I particularly enjoyed working with sprigs of lavender. Umbels, too, can produce fantastic results: especially simpler ones, such as dill and golden lace (Patrinia scabiosifolia). The tile below includes the flowers of golden lace and a burnet (Sanguisorba tenuifolia ‘Purpurea’, I think). Leaves can work very well: particularly those that are relatively flat, with distinct veining, lobes, or divisions. I made the tile below using multiple layers of ginkgo leaves. 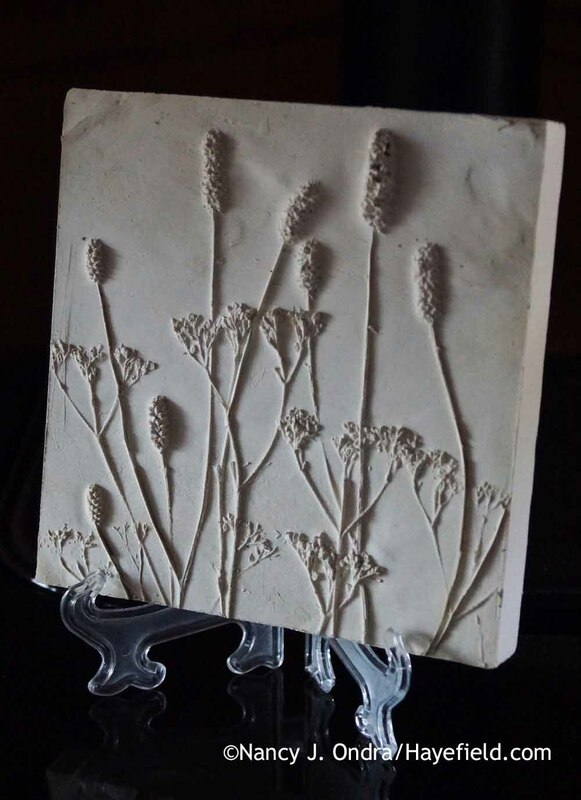 Stems, buds, and berries create particularly strong impressions, giving the finished casting a lot of three-dimensional interest. This sprig of eastern red cedar (Juniperus virginiana) was one of my best results so far. I liked this bit of wild crabapple, too. It would have been too busy with the leaves. 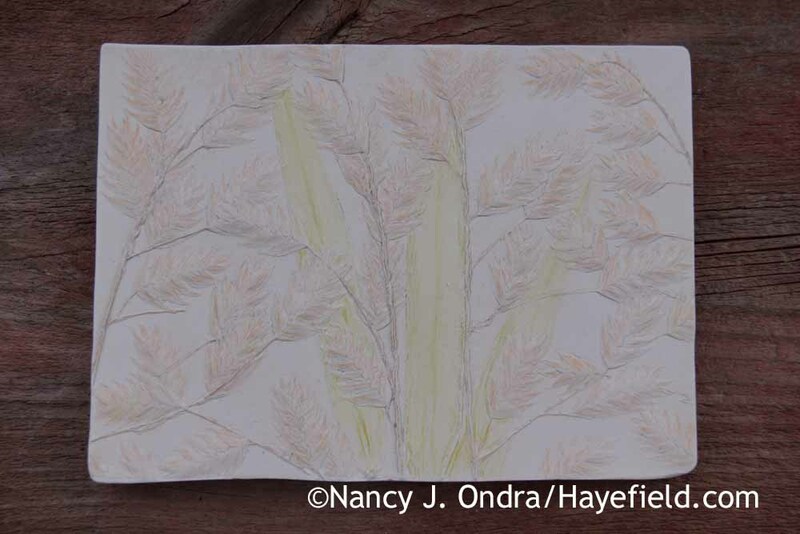 Grasses are particularly gorgeous subjects in leaf and in bloom. Below are a few stems of Korean feather reed grass (Calamagrostis brachytricha). …but oh, what a nightmare! 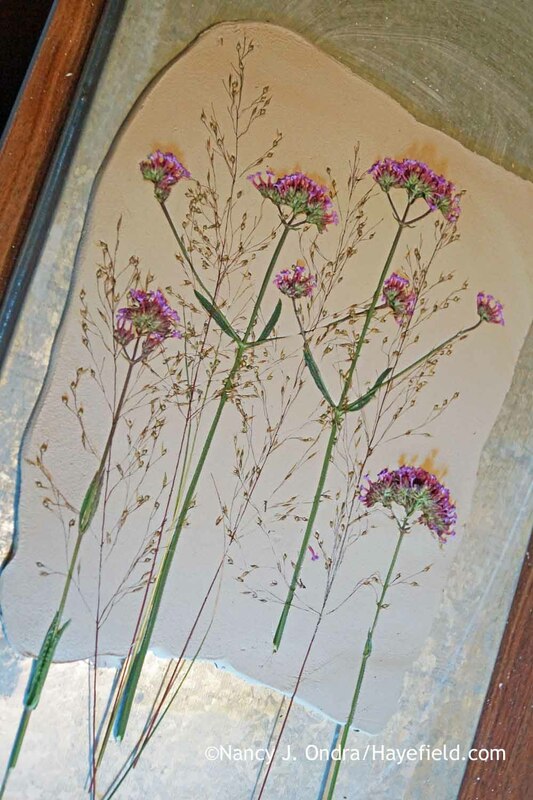 As I lifted the stems, many of the verbena blooms and grass seeds were left in the clay. I picked out loads of them before making the casting, but I ended up with a bunch of seeds stuck to the plaster in the finished tile. This one ended up in the mistake pile. 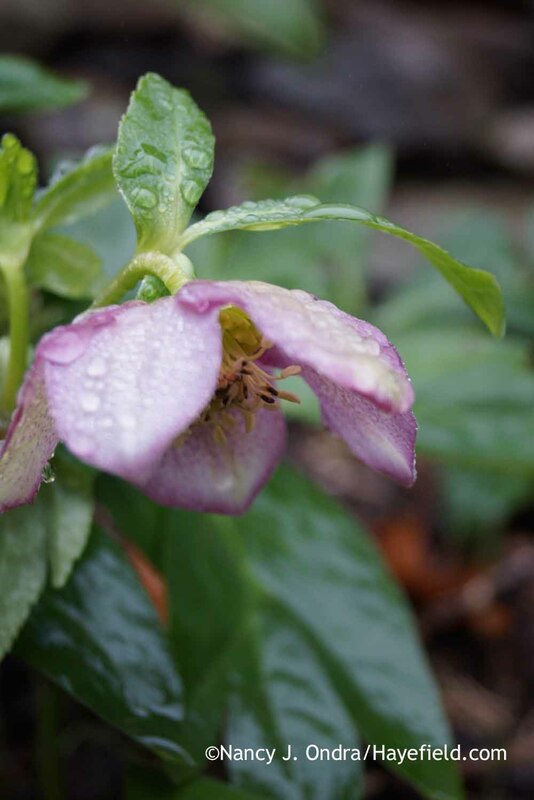 I’m very much looking forward to working with spring plants, but I didn’t have to wait for one of them: Thanks to our unseasonably warm December, I had Lenten roses (Helleborus x hybridus) in bloom for Christmas Day. This is a tile I made just yesterday with that bloom. It’s a bit hard to see the impression because the plaster is still wet. Once the plaster dries, there are a number of ways to finish the tile. I tend to prefer the natural look, with a bit of the clay patina left to give a sort of aged look to the plaster. 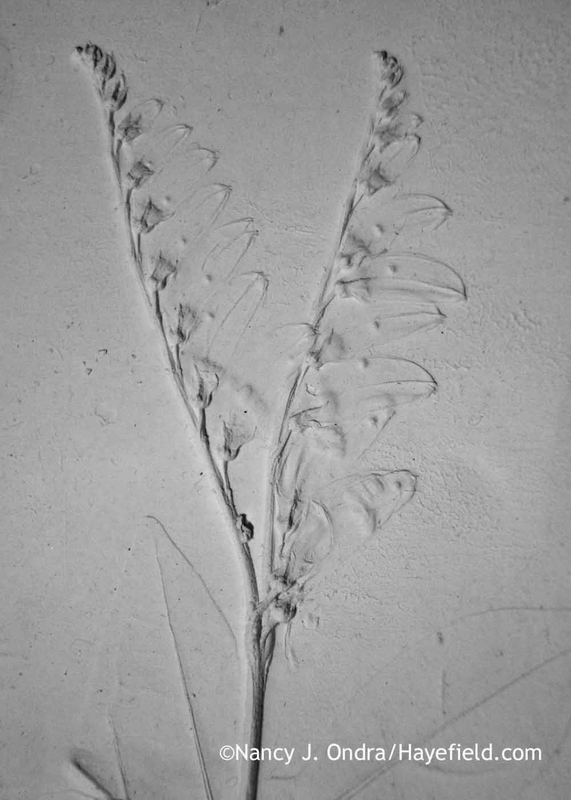 You can also paint it solid white or any other color, or use faux-finishing techniques to make it look like metal or stone, which would emphasize the fossil-like look. I learned to not be upset about damaged or broken tiles, because they end up being very handy for trying out different finishing techniques. Of course, I couldn’t resist adding color to some of the best results. I tried colored pencils but found that they dug into the plaster if I pressed too hard, so the ultimate effect was a very light tint. Regular watercolors and acrylic paints were much more flexible: I could dilute them a lot for very pale colors or build up the intensity for richer hues. Imagine the possibilities with daffodils, ferns, and mmm…so many other spring and summer beauties: yet another reason to look forward to the new growing season. May it come soon for us all! Hi Sue! 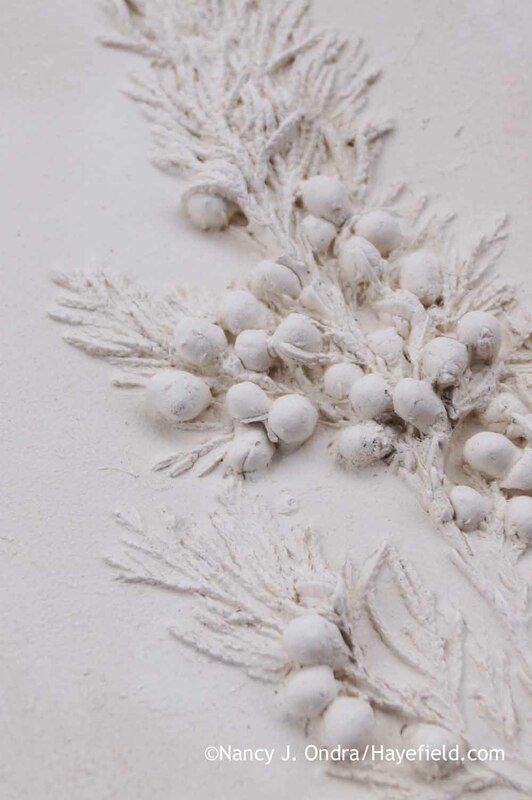 When I was researching the technique, I ran across a variation that uses plaster cloth. 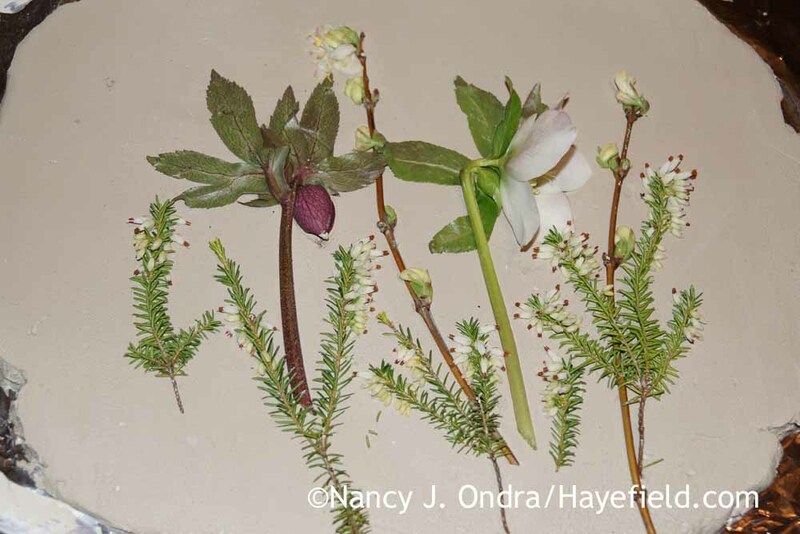 It’s something that could lend itself well to a garden club meeting: MUCH less messy and no clay involved: http://www.dickblick.com/ProjectIdeas/Botanical-Illustrations/. Thanks so much for this wonderful post! You should write a mini book on this wonderful way to preserve memories of the garden. 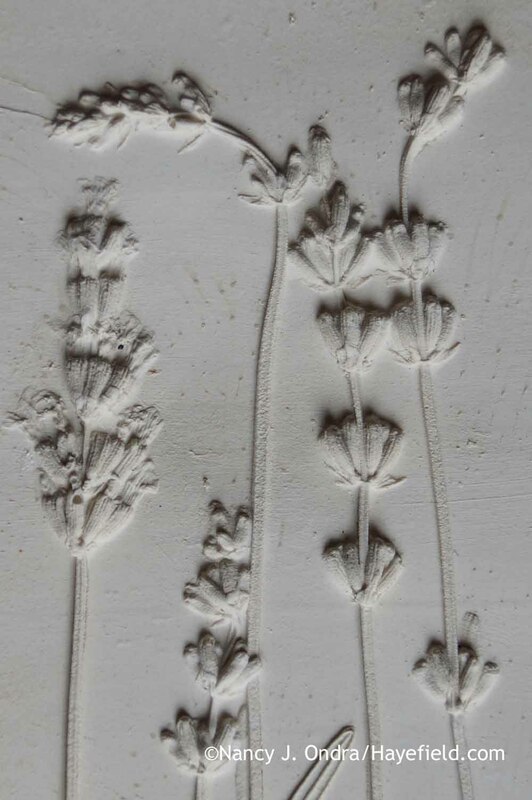 2 quick ( I hope) questions – what did you use to grease the frame and is there a trick to getting the plaster of paris the perfect consistency? Hmmm…maybe an ebook isn’t a bad idea! In the meantime: I used Vaseline on the frame. It didn’t take me long to learn that the mixing directions on the plaster container weren’t right for the tiles. You need to keep adding the dry plaster to water until the powder stops “melting” into the water and starts sitting above the surface before gently stirring it in, so the solution is really saturated. Sometimes I add even more plaster after that. The more fluid the mix is, the more likely it is to slip through any tiny spaces and leak out. I have not seen that technique before. You have beautiful results. Isn’t it amazing how well it works, even for beginners? My very first one was with the last bloom stem on my obedient plant (Physostegia virginiana), and it was gorgeous. 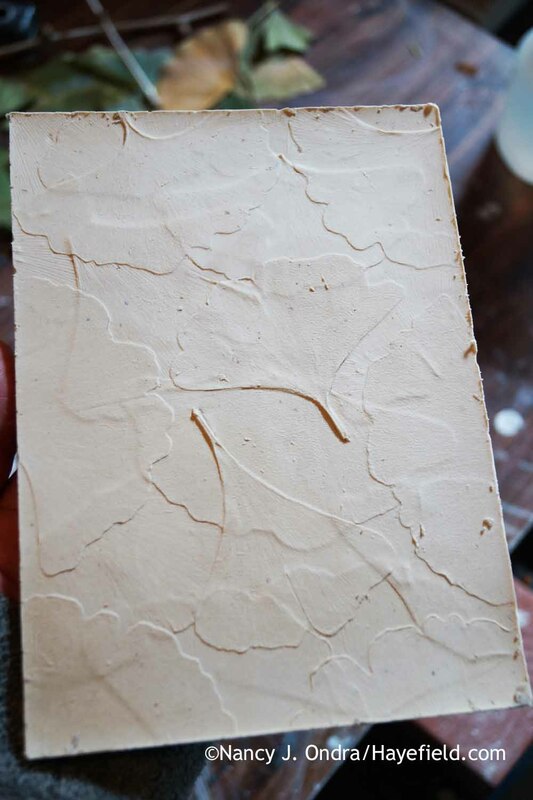 Unfortunately, the resulting tile was too thin (I tried using a picture frame to container the plaster, which turned out to be a bad idea) and it broke as I lifted it. I’m looking forward to trying that plant again next summer. Happy New Year, Nan. I loved the tile impressions..beautiful. I can see why you were drawn to do them. Thank you for sharing with us. And to you, Sandy. Who could have imagined that we’d have fresh flowers to work with in December? Looks like were heading back to “normal” winter conditions soon. Sure would be nice to see the sun again, though! If you end up with questions, Jen, don’t hesitate to get in touch. It takes a bit to get all of the materials collected and set up a work space (it’s not something you want to do in your kitchen). But once you get started, the process itself is really enjoyable and a great way to immortalize some of your favorite plants. Sadly, the mistake pieces are often the most beautiful–except for, you know, being broken. 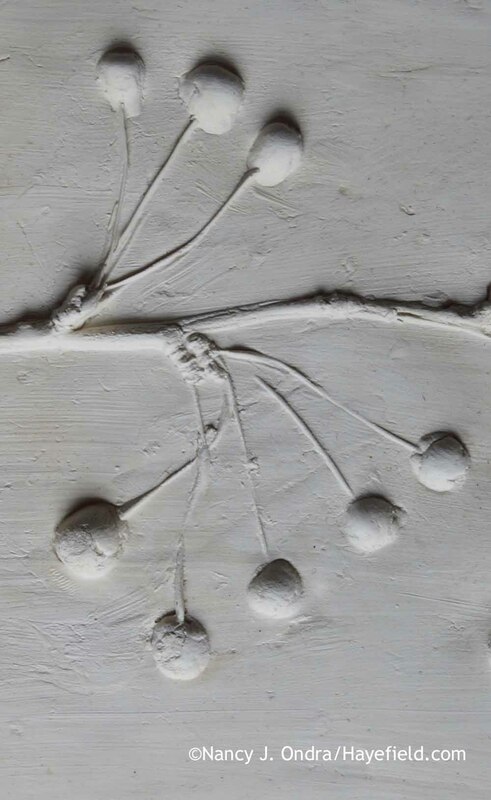 Or plastered (so to speak) with seeds…. Oh yeah, and the cool thing is that you don’t have to wait until fall: You could cast the leaves any time and paint the impressions with any colors you’d like! These are beautiful!!! I remember the story in GI well. 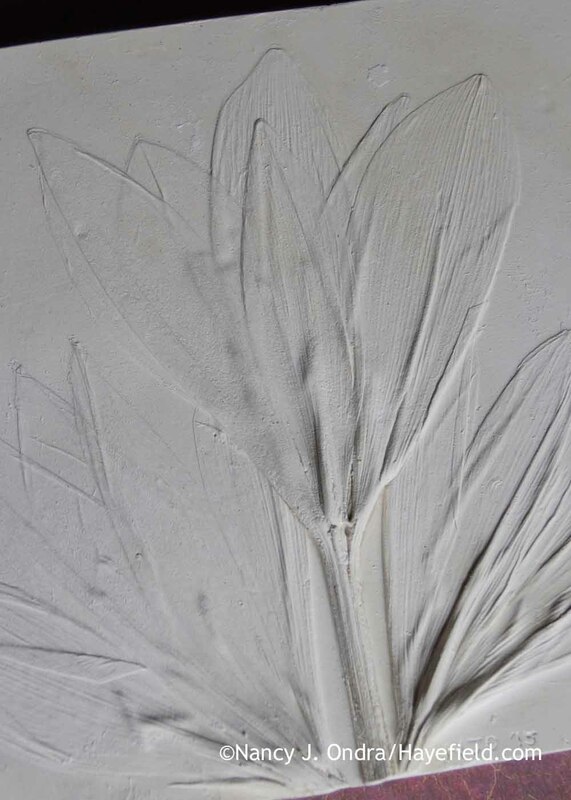 And I think the same person did the leaf castings for the the restaurant Spring in Somerset House in London designed by Jinny Blom. Would you ever consider teaching a class at Madoo? Or am I going to have to figure this out???? Hahahahs!!! Happy New Year and thanks again for the seeds! I bet you’re right; she’s very well known. I’d love to teach this, but I don’t travel. I encourage you to give it a try; if you get stuck, get in touch. 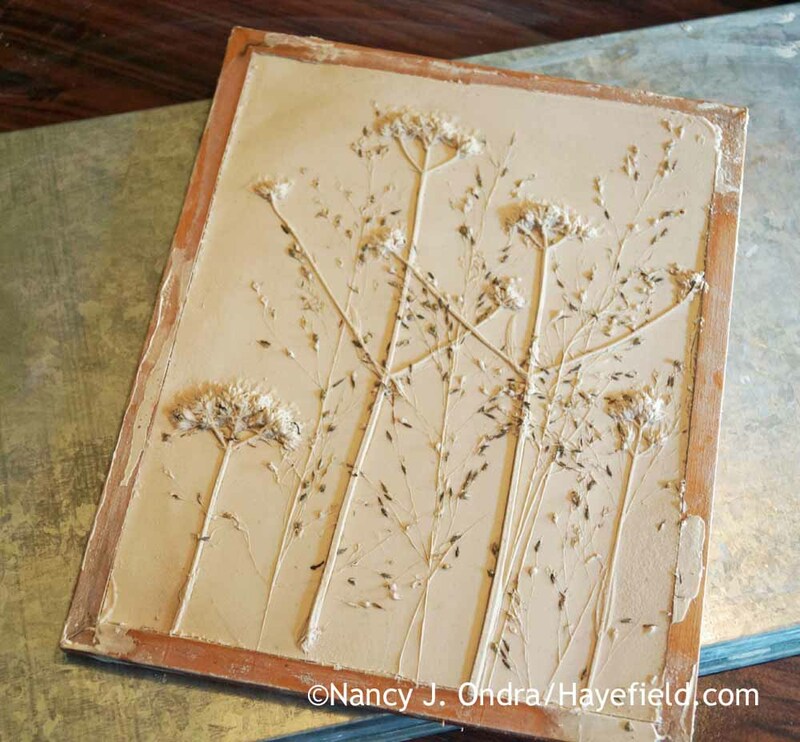 You’d probably have to plan for an all-day workshop, because it’s not a quick process, what with gathering the plants, preparing the clay, doing the pouring, and then waiting for the plaster to set up. And then, the cleanup! Thanks, Mel. Same to you! Hi, Nan. Happy New Year! Thanks for the interesting post. 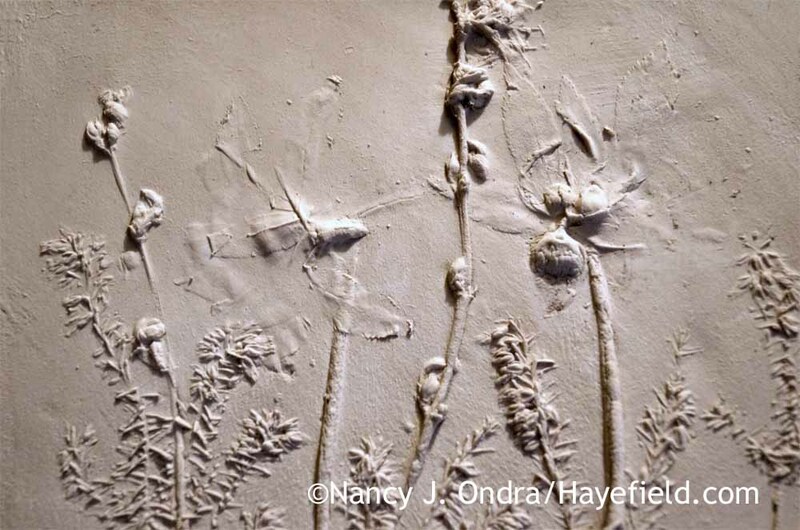 I had just finished checking out hypertufa sculptures on pinterest so it more or less continued on a theme. How clever and typical of you to just get stuck at the clay work. The results are spectacular. Have to admit I was really sold on the natural look but was then totally arrested by the last, colour shot. It looked so much like a fired ceramic tile. Oh, the possibilities….Enjoying cool and sunny weather here. Gotta get my tulips bulbs in! Ah yes, I tried my hand at hypertufa many years ago. That experience was influential on this project: This time, I made sure to wear gloves (and a mask too) when mixing the plaster. Using the gloss polyurethane over the painted tiles really does make them look like ceramic, without the need for a kiln. Have fun with the tulips! Definitely an e-book, Nan. Those are beautiful! Did you wind up painting the colchicum one? Thanks, Kathy. I haven’t decided what to do with the colchicums. 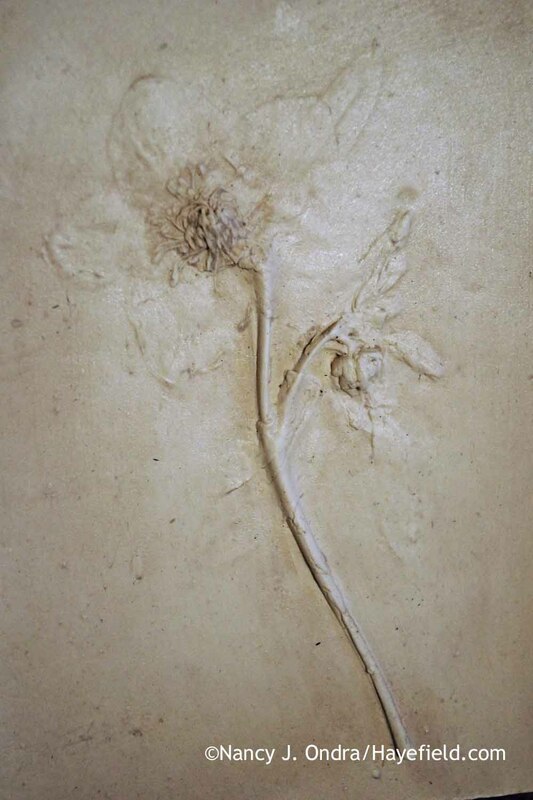 Color would help to make the blooms more visible, but the natural finish matches the delicacy of the impression. 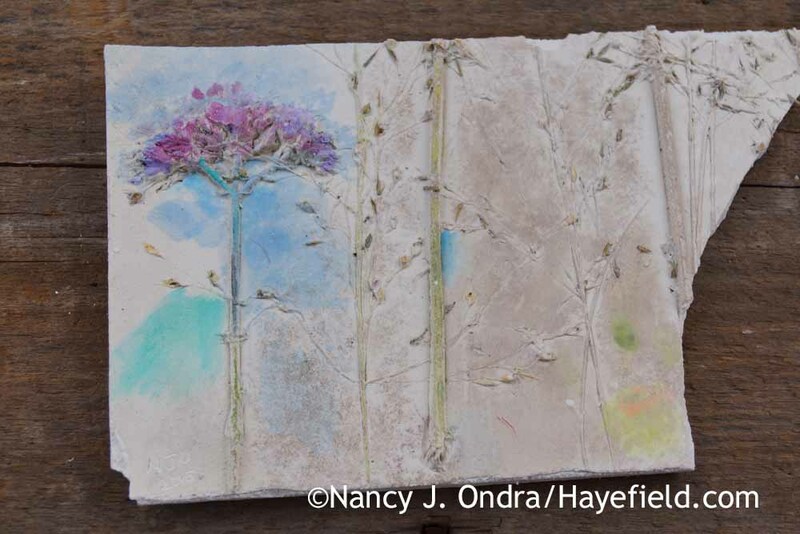 I wish I’d made more than one tile with them; it’ll be a long time until they bloom again. You can see why it’s so tempting to try the technique: to get results like that without years of training! Thanks for stopping by, Barbara. I hope you and the crew are doing well! 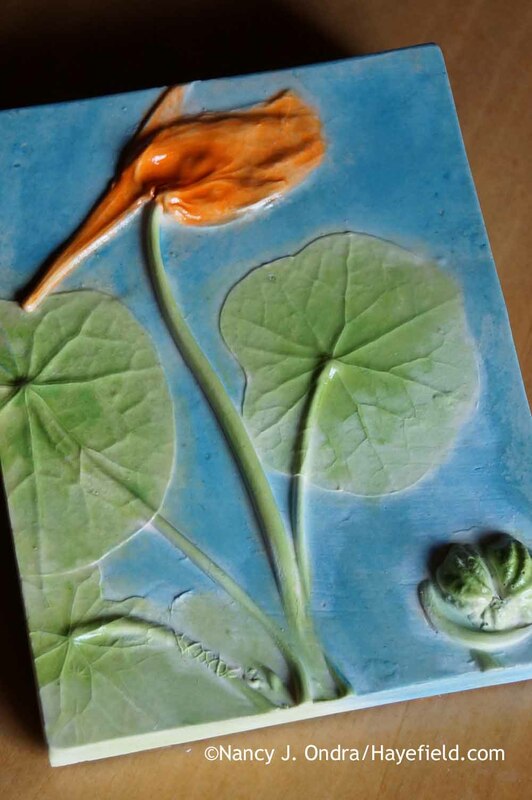 The painted Nasturtium tile made me think of Majolica pottery. Beautiful. Nan, you are so talented. Happy New Year. Thank you, Sandy. It’s something anyone can try, though: The plants do all the hard work, and the coloring-in part is fun. Fascinating and interesting, this is something I would now like to try…Have a wonderful 2016. I bet some of your clematis would be great candidates, Charlie. I’d love to see what results you get! Wow, these are really exquisite! Nice work, Nan! You’re so kind, Ginny; many thanks! What an interesting craft! It looks to me that you’ve had a great deal of success with it. Perhaps there’s a book on botanical crafts in your future?! That would be really interesting to write! I’ll have to think about it. It is great to see your artistic side come out in a different way. These are beautiful plaques. I see you with a whole new sideline. Happy New Year! Ah yes: The fun of creating things, then the necessity to find good homes for them. Thank goodness for Etsy. Happy New Year to you too, Lisa! All good wishes to you too, Pam. Don’t hesitate to email me if you want details about the casting technique; it may take me a bit to get around to writing up what I’ve worked out about the process. These turned out just beautiful! I love trying various crafts at this time of year too. We were very lucky to have fresh plants to work with this time of year here in PA. Looks like we’re in for a couple of below-freezing days, though, so I’ll be back to working with twigs. Or, maybe it’s time to try a new project for a bit. Have fun with yours! Impressive and gorgeous! My favorite is the cedar (seasonal, too! ), but that Sanguisorba-Patrinia one is beautifully composed and amazing in its detail. I vote for leaving the Colchicum be; you’re exactly right that the ethereal effect is a big part of the charm of the bloom impressions. I really appreciate the feedback, Nell. I agree: The colchicums will remain as they are. Back from admiring the impressions in your Etsy shop, and encourage everyone reading along to take a look. The “full Monty” of the crabapples is really stunning. Hey, thanks! I’ll be adding more tiles as I get them finished. And I have lots more seeds to list too! Poppy pods could look really neat, Barb; just make sure you shake out all of the seeds first. 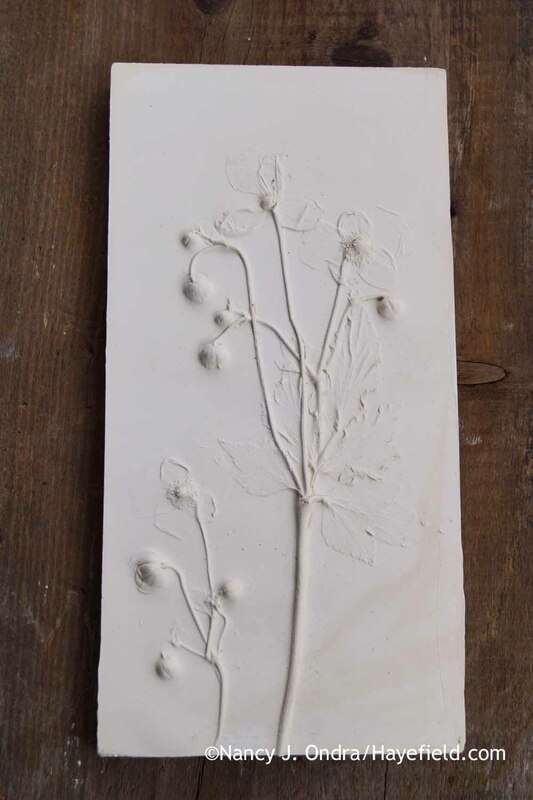 I’d also try hand-pressing them into the clay, rather than using a rolling pin (which does a good job on giving a nice, even impression from most plants), since it might crush them. What an interesting technique, Nan, and your results are so creative! Yet another way to bring the beauty of the garden indoors: particularly appreciated on a day that we’ve not gotten above freezing! Just beautiful! My husband and I went through our utensils this year and got rid of several old wooden spoons and spatulas! instead of throwing them away, I labeled the spoons with names of herbs in my garden and stuck the handles in the soil–it turned out very cute and took no time at all! That’s a really cute idea, Sarah; thanks for sharing! I’m impressed, if you’ll forgive the pun. Yes, truly I am and I want to have a go myself. I didn’t go to the article yet but am hoping that your simple instructions will do the trick. I even have the plaster of paris from doing a fossil project for my grandson. I thought every one of your impressions was wonderful-even your failure. What great gifts these would make. Thank you. Now to go read the magazine article. Ooh, have fun, Jenny! Feel free to ask if you have any questions. My goodness: I think that is a brilliant idea. Thank you, Hazel!!! Thanks so much for posting this Nan. Your results are beautiful and intriguing. My only question about the process is what kind of clay did you use? My guess is a type of plasticine as it is oily and would repel the water based plaster.. But just a guess. I am a big fan of your blog and love seeing “Hayefield” pop up in my email. Thanks, Kimberly! The clay is just ordinary white pottery clay. It has to be somewhat moist so it’s flexible enough to roll out and to accept the impression, but if it’s too wet, it sticks to the rolling pin and the plants stick to it. The plaster doesn’t interact much with the clay, except to possibly pick up a very thin patina, which you can wipe off with a damp sponge.